Esottia focus on original designs made with high quality crystals. Each piece of costume jewelry is produced with exquisite craftsmanship, is a part of an artistic expression, and has its own soul and unique story. With our collection of jewelry, Esottia aims at giving every woman a look that's elegant, versatile, and confident! Occasion: Party; Travel; Home; Business celebrations etc. 1.Keep it dry and avoid wearing it when bathing, doing housework and swimming. 2.Perfume can be corrosive to jewelry. Try to wear your perfume before putting on the piece. 3.Try not to touch it when you have grease and sweat on hands. 4. Rub your Jewelry with baby wipes: they perform miracles on crystal jewelry. 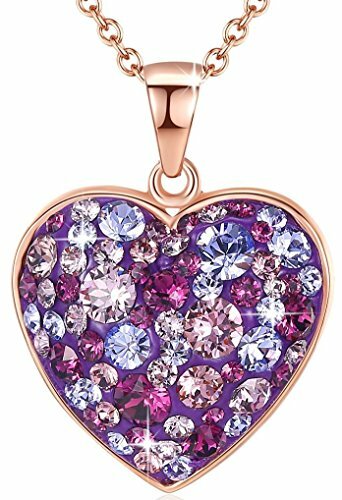 MULTI-STONE HEART DESIGN --- Available in a myriad of colors, effects, shapes and sizes, jewelry pieces made with Swarovski Crystals offer designers a fabulous palette of inspiration. This heart shape pendant is fulfilled by many smaller stones in multiple colors, symbolizing one's heart being filled with love bit by bit, day by day. ENVIRONMENTAL FRIENDLY MATERIAL --- This product is lead-Free & nickle-free, made of brass copper and passed Swiss SGS Inspection Standard, not harmful to your health. Women can wear this all day without any issue. NECKLACE SPECIFICATION --- Pendant size 0.83" x 0.88"; Chain: 18"+2" (Extender), perfect match for a V-neck top; Plating: 18K rose gold plated; Cable chain with lobster claw clasp. The chain is strong and durable, and won't break even when a baby pulls it! SPECIAL GIFTS FOR SOMEONE YOU LOVE --- It comes with a luxury jewelry gift box colored in two-tones - pearl black and glittering grey. It's a perfect gift for occasions like birthdays, anniversaries, Christmas, valentine's day, and mother's day for your mother, wife, fiance, and girlfriend. For them this is not just a gift, but a mountain of love! HOW TO CARE FOR YOUR JEWELRY --- Keep it dry and avoid wearing it when bathing, doing housework or swimming. We are committed to providing the best women's jewelry, 100% satisfaction and money back guarantee. If there is any problem with the purchase, please don't hesitate to contact us, we will help fix the problem. If you have any questions about this product by Esottia, contact us by completing and submitting the form below. If you are looking for a specif part number, please include it with your message.